She disappeared from her Milwaukee home after her mother Sierra Robinson was allegedly shot and killed by her father Dariaz Higgins. 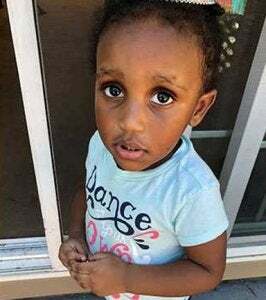 The body of Noelani Robinson, a missing two-year-old Milwaukee girl, has been found almost 250 miles from her home. Her body was found on Friday by an off-duty public works official driving along Highway 218 in Minessota after she went missing earlier in the week. She disappeared after her mother, Sierra Robinson, was allegedly shot and killed by her father Dariaz Higgins, the Star Tribune. According to law enforcement, Noelani was found wrapped in a blanket, having died of blunt-force trauma to the head, CBS Minnesota reports. “We believe we have found Noelani. We believe that currently, this is going to be a death investigation,” Milwaukee Police Chief Alfonso Morales said at a news conference Saturday. Higgins, who is said to be a pimp, was arrested Wednesday and charged with first-degree homicide in the death of Sierra Robinson. Morales said the suspect is the “textbook definition” of the kind of individuals law enforcement is confronting when battling human trafficking, the Journal Sentinel reports. According to the criminal complaint filed in Milwaukee County Circuit Court, Robinson became pregnant while Higgins was her pimp. The couple stayed together after Noelani’s birth, but Robinson decided to end the relationship. She moved to Las Vegas last month, leaving the child in Milwaukee with Higgins. But she soon returned hoping to get her daughter back.